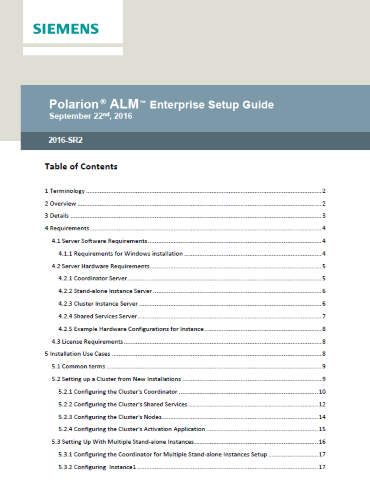 Download now: "POLARION ENTERPRISE SETUP GUIDE"
This guide is designed for our customers who need capabilities for load balancing and failover strategies. The guide explains how to set up a clustered Polarion instance in which several physical or virtual machines comprise nodes in the topography, with all nodes sharing a single repository. Also explained is how to set up an environment running multiple Polarion instances, each with its own repository. This document supplements the Polarion Installation Guide documentation for Windows and Linux, which you will need in addition. Start with this guide, following the instructions for installing Polarion on the various machines, during which you will need to refer to the installation guide for the operating system you you use. You will then perform the one or more of the configurations outlined in this document to arrive at the infrastructure you want.